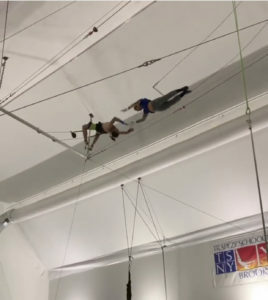 I’ve been doing flying trapeze for 2 years now and have been seeing more and more patients from the circus world. I found this great resource for performing artist called the Journal of Medical Problems of Performing Artists. Thought I’d get an overall sense of what we’re seeing in the clinic with this population. The main categories of artists are: Acrobats, non-acrobats, musicians, sudden load artists, non-sudden load artists ** sudden load and non-sudden load are newer categories that seem to be used more recently by Cirque Du Soleil. Because of Cirque du Soleil’s full -time physical therapy injury reoccurrence is low . Overall, a great article on the overview of injuries and terminology within the arts research. I will try and dive a bit deeper into this throughout the month. 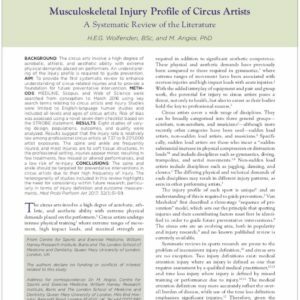 If you have any favorite circus arts research articles I would love it if you could share it!